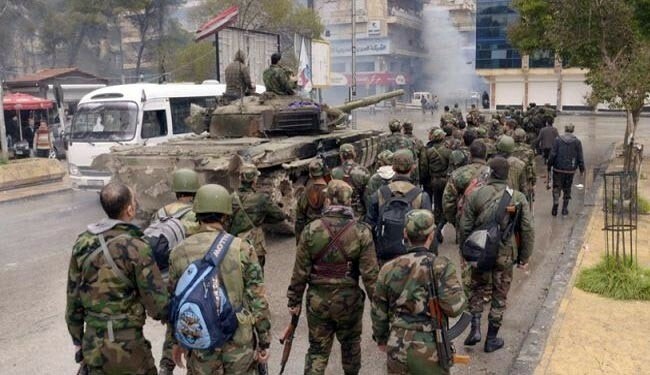 JNN 28 July 2014 Damascus : Syrian armed forces have engaged in major military operations against insurgent fortifications and staging grounds in the outskirts of Aleppo, Daraa, Homs, Idleb and Hasaka, inflicting heavy losses on the foreign-backed militants. The state news agency SANA said the army forces on Sunday stormed “terrorists’ gatherings” in Hasaka, inflicting heavy losses upon them, in addition to destroying their weaponry. It said the army units recaptured the center of teenagers’ penitentiary, the Martyrs Cemetery and al-Ahrash area at the southern rim of Hasaka. An army unit killed a large number of armed insurgents after targeting their staging areas and destroying vehicles equipped with heavy machineguns in Handarat, Rasem al-Abboud, al-Sheikh Lutfi, Khan al-Asal, Tal Khattab, al-Sheikh Said, al-Zarbeh, Bawabiyeh, Babansh, Haret al-Shahadiyeen, Hreitan and al-Ramousa. Meanwhile in Daraa, government troops destroyed a number of vehicles carrying armed insurgents in Inkhel town and to the south of Khazan al-Oseileh in Daraa countryside. Another army unit ambushed an insurgent staging area on Qita crossroad in Om al-Mayaden town, killing numerous armed elements and injuring others. Also in Homs, army units targeted insurgent fortifications and staging grounds in Kafar Laha, Wadi al-Kahef and al-Quneitrat in the rural area of the province, killing and injuring scores of armed intruders. The army units further ambushed insurgent hiding bunkers and staging centers in Kansafra, Qmainaz and the areas surrounding al-Arba’in mountain and the central prison in Idleb countryside. A day earlier, the Syrian forces dislodged the IS fighters from the al-Shaer natural gas field in the central province of Homs after the IS stormed it last week. This entry was posted in Middle East and tagged IS, ISIL t, ISIL Terrorist, ISIS, Syrian Terrorist, Wahabi Caliphate. Bookmark the permalink. I ALWAYS APPRECIATE THE NEWS THAT BOTH SUNNIES & SHIAS , THE TWO MAJOR SECTS OF ISLAM ARE FACING THE INFIDELS SIDE BY SIDE AND WISH THAT THEY AFTER THE COMPLETION OF MISSION ”GET RID OF TAKFIRIS ONCE FOR ALL” GO ALL OUT FOR THE LIBERATION OF THE HOLIEST OF THE HOLY HERITAGE OF OURS” FROM THESE LINEAGE OF JEWS USURPING , DESTRYING, EXPLOITING .LET MAKKAH MADINA HAVE VATICAN LIKE STATUS , SOONEST THE BETTER .SEE THEN HOW ALL THE MUSLEMEEN WILL BE SO UNITED AND WE CAN WITNESS THE NEAR END OF TERRORISM .